Aedes aegyptiCDC, JAMES GATHANYThe Zika outbreak that has spurred a public health emergency throughout Central and South America may have peaked, according to an analysis by researchers at Imperial College London, U.K. Study coauthor Neil Ferguson and colleagues used available public health data to model the virus’s spread, finding that the epidemic is likely to burn itself out within three years as the population achieves herd immunity. It will likely be at least a decade before the next outbreak, the researchers reported today (July 14) in Science. “If our projections are correct, cases will have dropped substantially by the end of next year, if not sooner,” Ferguson said in a statement. Traditional mosquito control efforts are unlikely to be successful, and could have the counterproductive effect of prolonging the epidemic, Ferguson and colleagues noted in their paper. 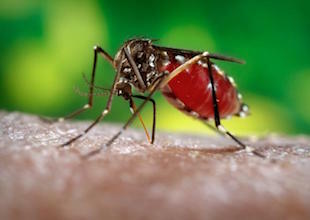 In a review published in the same journal, Ferguson and colleagues summarized the research on Zika to date, arguing there’s a need to get better at predicting infectious-disease outbreaks. “The rise of Zika after its long persistence as a disease of apparently little importance highlights how little we truly understand about the global spread of mosquito-borne viruses and other lesser known diseases,” study coauthor Justin Lessler, an epidemiologist at Johns Hopkins University in Baltimore, said in a statement. In a third paper, Karin Stettler of Humabs BioMed in Bellinzona, Switzerland, and colleagues reported on their isolation of antibodies from four people who were infected with Zika in the current epidemic, two of whom had previously had dengue fever. The researchers found that two groups of antibodies were highly cross-reactive. This could help explain why people who have previously had dengue may be more likely to become infected with Zika in areas where both viruses are circulating. However, a third group of antibodies were 90 percent specific to either Zika or dengue. When the researchers injected these antibodies into mice one day before or after infecting them with Zika, the animals were fully protected, suggesting a possible vaccine target.